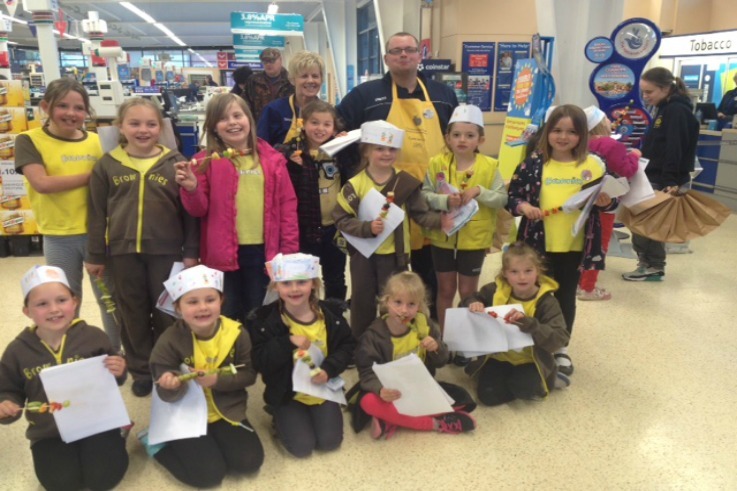 Craven Arms Brownies spent an evening at Tesco in Ludlow on the Farm to Fork trail. It was the first time Ludlow Tesco’s have done this so the girls were very excited. They were greeted by an welcome announcement over the stores tanoy system and were then given a booklet of bits that we were going to work through over the evening. First job was to pop on a tabard and colour in a hat to wear and first stop was the cheese counter where they learnt all about cheese, what animals it comes from, the cheese making process and then they learnt about 5 British cheeses along with lots of tasting and mini cheese experts in the making! Next was a trip to learn about vegetables and fruits, with fruit tasting and mini kebab making. A drink followed along with some goodie bags for the girls and time to leave. Excellent night all round. If you would like to organise a Farm to Fork event for your unit, get in touch with your local Tesco store.